Fish was always a stable in our house growing up. Since we lived in Seattle fish was inexpensive and easy to find and we ate it at least once a week. I was fortunate that through my friends parents and my mom's friends I was introduced to a wide variety of ethnic dishes involving fish and various ways to prepare it. The only problem I ever encountered was the year that my mom decided that I should gut the fish that I had caught at the indoor pool at the hunting and fishing show. Yuck! I am not so great with gutting fish, I can do chicken easily, but there is something about gutting fish that is far less appealing. Plus you actually have to be careful to get out the bones and at ten that didn't work so well. As an adult I still prepare some form of seafood about once a week. One of the great ways that I have found to add flavor to pasta dishes is to incorporate anchovies, when used in moderation they create a delicious umami flavor. 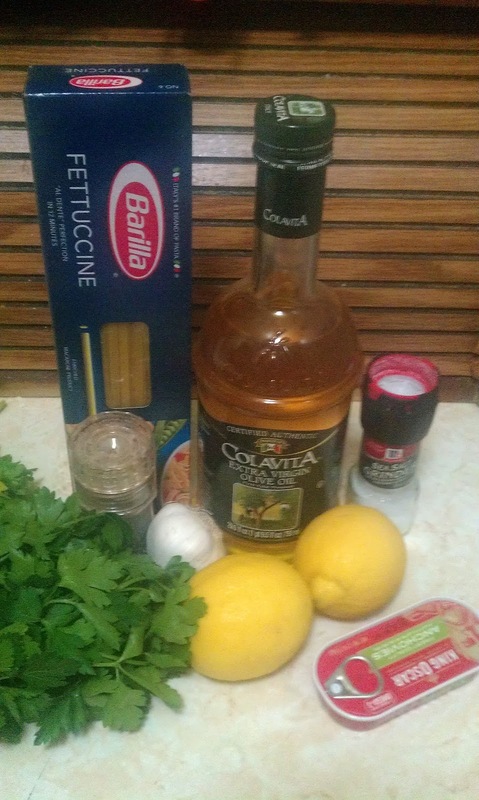 The May/June issue of Cook's Illustrated Magazine had a recipe for Olive Oil Sauce with Anchovies and Parsley utilizing anchovies to create a quick and easy pasta sauce. This recipe has 7 ingredients. It takes less than five minutes to prepare and cook and makes enough for one pound of pasta. All the ingredients are basic and I made no ingredient modifications. I used fresh lemons for the lemon juice since the taste is better. 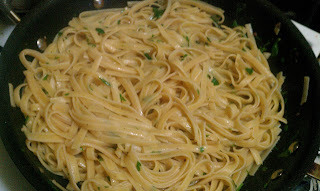 For the parsley I used Italian flat-leaf parsley, when chopped the texture is less gritty to me than regular parsley. I made one major modification to the recipe. The two anchovies suggested by the recipe didn't add enough flavor, so I added five more fillets. After the additional fillets the sauce had a much better overall taste. I followed the remainder of the recipe as written. I found this sauce to be too oily for my tastes. There seemed to be enough oil for two pounds of pasta not one. I did used fresh linguine from the store, I'm not sure if I had made the pasta from scratch if it would have absorbed more oil. If the oil was cut in half it would be a lot better for my tastes. I did like that the recipe was very easy to make and literally takes only minutes. With the changes that I suggested this recipe would work with a variety of fresh pasta varieties. This recipe is only available in the May/June issue of Cook's Illustrated Magazine or if you have paid for the online subscription you can find it here. That sounds and looks delicious! Mangia! Thanks :) We love pasta in our house! Thanks, for stopping by :) I hope you find some recipes that you would like to try! Thanks :) Best of all it was very easy! I linked up a recipe :) Thanks for the heads up!